Jimmy Fallon and Kevin Hart are going to need to breathe a little after handling some of these creatures. 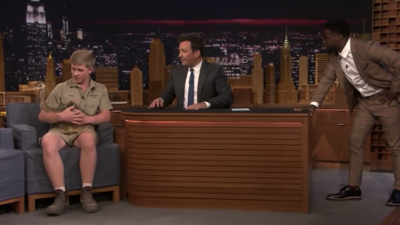 Jimmy Fallon and Kevin Hart might need to change their pants after handling some of these creatures. Robert Irwin, the son of the late Steve Irwin brought five different types of animals on the show. Ok, so we get to see each of them react to an ostrich, snake, tarantula and a falcon.